CWM Recovery Vs TWRP Recovery ! ! The Android Recovery which comes installed on any device has several issues, so that’s exactly why we finally consider that a custom recovery could be a much better choice as long as it find a way to reset your device when it may be impossible to boot into it. Clockworkmod is available for quite a while and it has managed to win the title of the most popular stock recovery replacement thanks to all its features. But another player had also entered the game being known as TeamWin Recovery Project (or simply TWRP) and we bet that you are curious about it as well ! ! 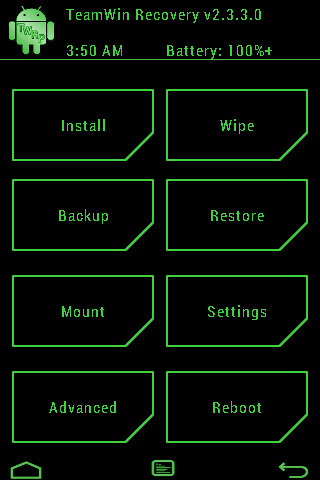 This fully touch-based custom recovery was initially dedicated exclusively to Nexus devices, but things have changed and now it is available for a variety of other smartphone and tablet models too, in form of official or thirdparty builds. TWRP. This one comes with larger buttons that make it even easier than before to spot the feature that you are looking for and select it with a simple tap. And don’t forget about the soft buttons for Home and Back here, or about the option to turn the display off after a certain amount of time. But this doesn’t necessary have to mean that the interface of TWRP is necessarily much better, but simply with some differences that can offer us a more comfortable and faster experience. This is one of the most used features in a recovery, but we must admit that we cannot actually compare CWM Recovery with TWRP Recovery at this chapter. They both work flawless when it comes to installing zip files, but some of you might consider that is easier to locate the zip file you want to install it in TWRP Recovery; and the built file manager is the one that makes the difference. If you select the backup option in ClockworkMod, the backing up procedure starts immediately for all the partitions, while TWRP proves to be ideal as long as it allows you to backup only one partition. To be more specific, it presents you several options that you can choose from, giving you the possibility to control exactly which partition you want to backup or in which storage you want this backup to take place. So here, we can definitely say that TeamWin Recovery Project can successfully replace ClockworkMod. This time, when it comes to restoring backups, ClockworkMod recovery comes with an advanced restore option which lets you restore just one partition, while TWRP recovery gives you the possibility to select as many partitions as you might want. Even more, partitioning the SD card in ClockworkMod is by default set to ext3 file system and you have no chance to change it. TWRP instead lets you change it to ext4. So, TWRP seems once again to have won the battle, but we must tell you that besides the interface or the backing up and restoring backups options, it actually provides the same features as ClockworkMod. But ClockworkMod comes with one click installation (via Clockworkmod’s own ROM Manager app), while TWRP can be installed with some adb commands, so this aspect comes in favor of ClockworkMod recovery. After seeing all these, we consider this choice as a personal preference. Some of you like might indeed like the TWRP recovery better thanks to all these differences that I have told you about, but it doesn’t have to mean that’s a general rule. You can switch between them CWM Recovery and TWRP Recovery by flashing the recovery, so I recommend that you should try both of them before taking the final decision.